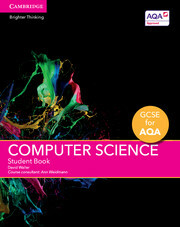 A new series of bespoke, full-coverage resources developed for the 2016 GCSE Computer Science qualifications. 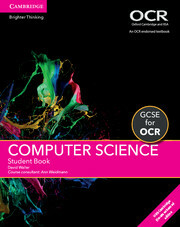 Written for the OCR GCSE Computer Science specification for first teaching from 2016, this print Student Book and enhanced digital bundle is designed to help students master underlying computing principles and concepts, and develop their computational thinking, programming and problem-solving skills. Interactive worksheets consolidate students’ learning and rich digital content including animations help relate computer science to everyday life. This resource allows students to annotate text and add audio notes, and enables teachers to assess, track and report on students’ progress. Accessible online and on tablet devices through the Cambridge Elevate app (iOS and Android). 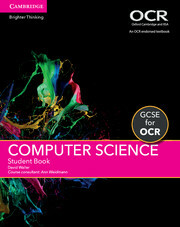 Tailored to the new OCR GCSE Computer Science specification for first teaching from 2016. Easy-to-follow chapters, including learning objectives at the beginning of each chapter and challenges that build on these objectives, provide a clear structure for student learning. Programming projects build programming skills, knowledge and confidence in preparation for the non-examined assessment. Contains contextual activities to support the less confident and open-ended challenges to stretch the more able. 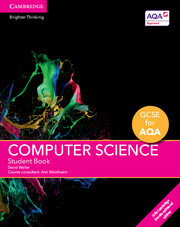 Highlights the key mathematical skills relevant to Computer Science throughout. The Cambridge Elevate enhanced edition contains a wide variety of practice problems, interactive worksheets and exam-style questions to help with exam preparation and allows teachers and students to annotate text, add audio notes and link to external resources. 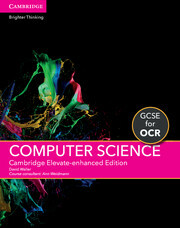 The Cambridge Elevate enhanced edition contains rich digital content including animations that help students relate Computer Science to everyday life. The Cambridge Elevate Assess to Progress tool provides support for assessing, tracking and reporting on students' progress. Accessible online and on tablet devices through the Cambridge Elevate app (iOS and Android). 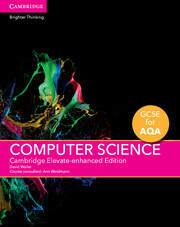 For information on how to use Cambridge Elevate editions and on supported devices please visit elevate.cambridge.org/support. A free digital Teacher’s Resource is also available. David Waller is an experienced Computing Teacher and Author. A former ICT Director, David has taught at KS3, GCSE, A Level and vocational qualifications such as GNVQ and DiDA. He has authored 14 published computing titles including textbooks, teacher resources, revision materials, online publications and interactive activities. David has always believed computational thinking and programming are vital as they allow students to develop problem-solving skills and an ability to express solutions clearly and creatively – similar to writing a story, a poem or composing music. Ann Weidmann has extensive experience of assessment and qualification design. Ann has taught computing in a variety of settings and held various positions at Edexcel including Assessment Leader, Qualifications Leader and Head of IT and Computer Science. She has co-authored a wide range of computing resources and teaching materials, regularly delivers teacher training both F2F and online, and is an Ofqual subject expert for computer science.